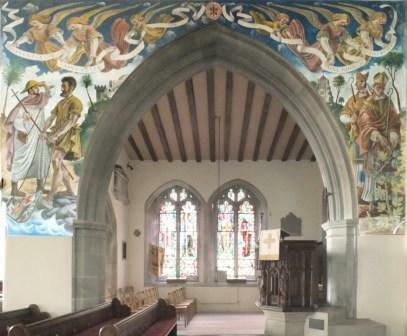 Alan Sorrell came back from the British School of Rome with the ambition of being a mural painter. 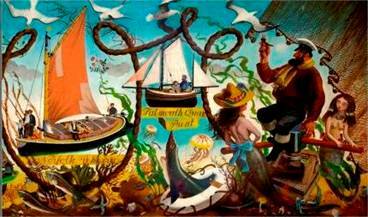 The first major commissions came from his home town of Southend to create four large panels on local historical themes. Carried out between 1931-2, this scene scene depicting an event in the 17th Century Anglo-Dutch wars is perhaps the best known of his early works. The research he went into to accurately recreate the costume, ships, rigging and coastline of the day was a training which was to be put to use in his later career in archaeological reconstruction. Following an interlude of WW2, Alan Sorrell picked up his pre war career in both archeological reconstruction drawing as well as mural painting. This was Alan Sorrell’s last and most extensive mural commission—54ft wide, it was unvealed at the opening of the school by the Queen Mother. Nearly 60 years later it is still in good condition despite being in a busy school of 1500 pupils. 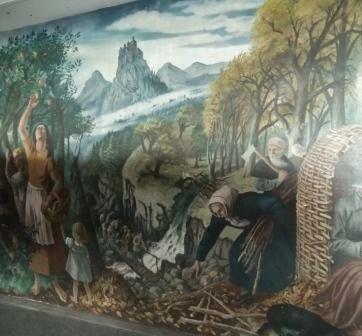 Alan Sorrell’s recently restored 1951 Festival of Britain Mural will be exhibited.